We know that over the years pioneers have traveled in search of new and exciting opportunities in horse-drawn wagons, canoes and on foot. 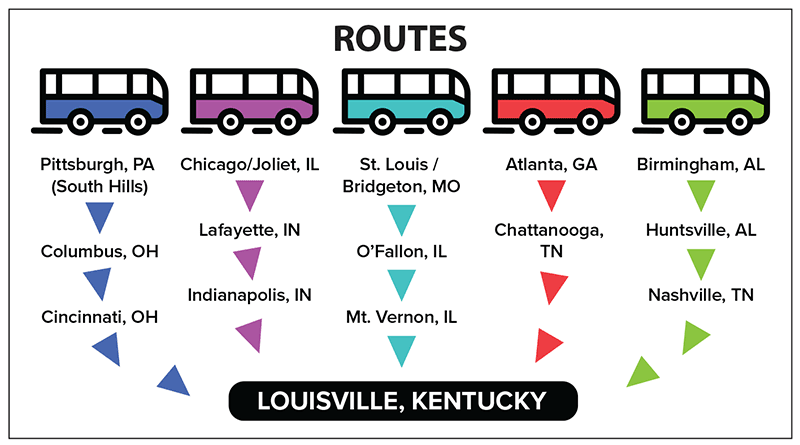 As a modern Pioneer seeking the answers to Pioneering a New Culture of Aging, how about traveling to the 2019 annual conference in Louisville, KY in a luxury motor coach? Sunday, August 4: leave from the point of origin between 7:00 AM – 8:00 AM local time, arriving in Louisville mid-afternoon. Wednesday, August 7: leave Louisville approximately 2:30 PM EST, arriving back at the point of origin late evening. Buses will have planned stops, including lunch, where riders can stretch and welcome new riders. A minimum of 30 riders are needed in order to run each route. Fares will be based on the number of riders — the more riders, the lower the fare.• Final fares will be determined when the bus route is confirmed. Maximum fare will be $199.00 roundtrip. Payment in full will be due by June 15. When a bus route has reached 30 and is confirmed to go, riders will be notified. If a route has not met the minimum required 30 riders by May 15, the route will be cancelled and deposits will be refunded. RESERVE YOUR SPOT ON THE BUS HERE! We need at least 30 reservations for each route by May 15, so don’t delay! In the event that the route is canceled by Pioneer Network, your deposit will be refunded, so take a chance, not a risk! No transfers to worry about — you will be dropped off at the hotel! You will travel in a luxury motor coach with reclining seats, access to WiFi, power stations for all your electronic devices, and TVs. And even enjoy a movie as each motor coach is equipped with DVD players to watch your favorites. You can decide how YOU want to spend your time — talking with fellow pioneers, reading a book, playing on your electronics, sleeping…whatever you want! Questions? Contact Joan Devine at joan.devine@pioneernetwork.net or 636-578-4164.